Being a Kansas City Baby Photographer, I have to say that six months is one of my very favorite ages. I am stocking lace rompers in the studio in neutral colors to use in my baby sessions! They have lots of give and stretch, so they will fit various degrees of “chunkiness”. Babies have filled out and have those sweet baby cheeks, too. I think it is important to capture this milestone where they can sit up on their own. It is all so new to them and they always have such a proud look on their faces. There are so many poses and angles we can get when a baby can sit up, you really shouldn’t wait for them to be standing. 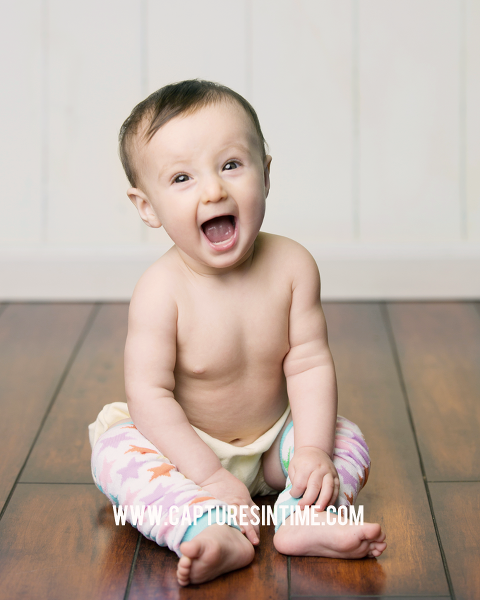 Six months is a key age to have portraits in the studio. With studio portraiture, the light is “just right”. You really cannot duplicate it outdoors. That is not to say that you shouldn’t do outdoor portraits at this age. Do both! This little doll was full of smiles and personality! Her little eyes are the prettiest color that you just don’t see that often. It reminds me of a gemstone with little flecks. I just love this little lace romper I have in the studio for 6-month babies from SAVANI boutique. See more babies in my portfolio.